Save valuable production time with dual swivel reels. Powered and non-powered. Max. capacities 150-500 lbs. Easy and safe head rotation. There is no better way to increase coil stock payout or rewind productivity. These reels save valuable production time. Rapid-Air dual swivel reels can be equipped with the same operating controls as any of our single reels. The swivel head is mounted on heavy-duty bearings for easy 180 degrees rotation. The swivel head locks into place with a secure latch. A safety switch automatically shuts off power any time the latch is not completely engaged. 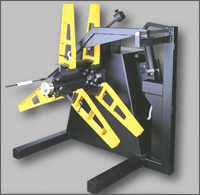 Swivel head rotation is easily and safely accomplished by depressing a foot-operated release lever which cuts power to both reel heads. The reel rotates with a light hand motion and the active reel can be started when the latch is engaged. The run switch easily reestablishes the operation of the reel. Only one of the reels can receive power to run at any time. A limit switch automatically selects which reel is in the operating position. A foot-operated release disengages the swivel latch to allow a 180 degree rotation on the non-powered models. Weight capacity is listed for each reel head and can be increased by 25% as coil width is reduced by 50%. Other coil width capacities available. Optional 9�-20� adjustment available. RS30 series. Special shaft diameters and extensions available. Higher or lower speed ranges available. Input power required is 115 VAC, single phase, 50-60 Hz.